Months ago I signed up for Jeannet's pincushion swap. here is her logo.........anyway it has arrived and been opened and today is Pincushion Swap show day. Jeannet has a great blog so check it out.............she does write in Dutch and I do lose a little understanding when it translates but it is worth the visit. When I first signed up for the swap there were only about 20 people in the swap but it grew to be a very big swap with I think well over 100 swappers.152 participants. I decided to make Larry the Lamb - Anni Downs Hatched and Patched design. Love working with the wool for something different and thought the sheep represented me and my farming lifestyle. Ohh, you make a very lovely comment, and your pincushions are adoradeble, I like the patterns from Hatched and Patched. Here in Holland it is still evening, but over a few hours we started also here the international pincushionday!! Thanks for your participation! Love you pincushions. You can never have enough of them. 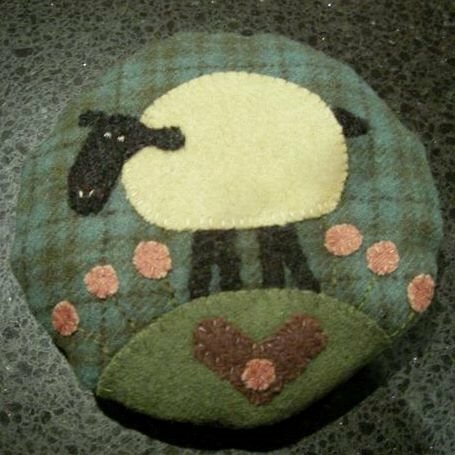 Lovely pincushions, i made the pincushion with the sheep last year, when i saw it i ordered it right away. I also love the pincushion with to clamp on the table. It's 22h35, here in Belgium so you will have to wait a few hours!!! scarneThe anonymous was me, Bizzy Martine. I always have problems posting comments. I have a Larry the lamb I have nearly made a hole in him I use him all the time. That bee hive is amazing what a clever idea using a clamp. 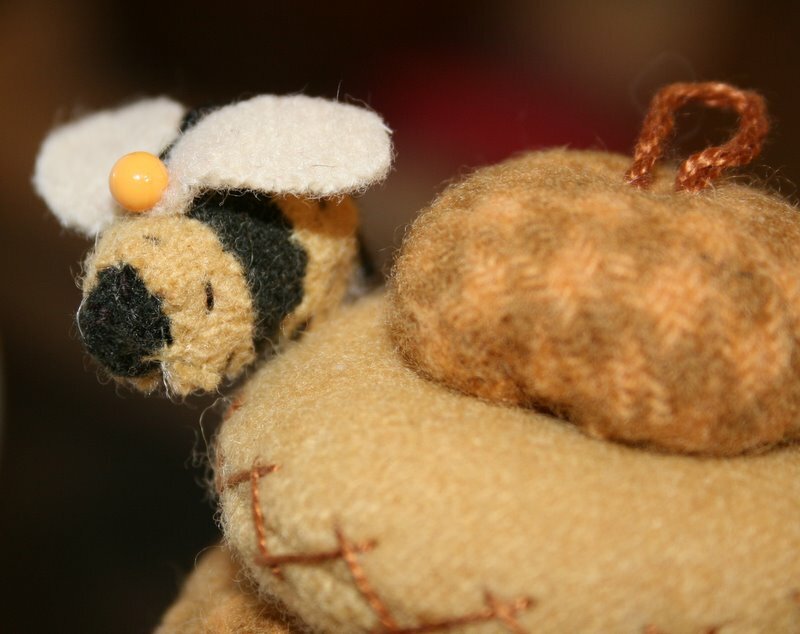 Your little lamb is a sweetie and how clever is the beehive pincushion with a clamp. Wonderful pincushions!!! I love the picture with all of them together, too! 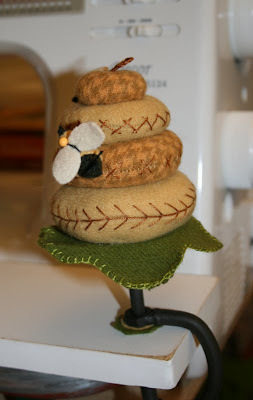 Really adorable pincushions both and, oh, goodness, what a fabulous idea that beehive on a clamp. I am forever knocking my pins and pincushion onto the floor while using the machine and I grew up with a carpenter for a father, why have I never before thought about putting my pincushion onto a clamp!? I love the pincushion you made and the one you received. It was a fun swap. And yes my SSCS is almost done. I have this pattern as well, but wondered where you got the walnut shells from. I have been looking for silica sand as well. Any would do. Maar het speldenkussen wat je hebt gekregen, is ook heel erg mooi. what gorgeous pin cushions - i love the sheep one - i have a soft spot for sheep as we used to keep some! Oh, what a lovely pincussions Dawnie and you made! I adore them! O wow, such fabulous pincushion - just great! and you both had a great swap-match. It was a very lovely swap, wasn't it? Ohhh what a lovely pincushions! Thank you to visit my blog. so lovely your pincushions, ohh I want to make them myself, nice blog also!! How lucky are we. We both love our pressies from each other and so do so many others. Thanks Chooky - Larry likes his new home and the bees seem to be happy there. didnt expect you do such a close up or wud have made stitches neater!!!! and no Larry has no tummy marks on him, must be the shade of light. Its Fiona and Evelyne was my swap partner. I thought you may recognise that pincushion. I enjoyed the pincushion swap. I hope it runs again next year. I love Larry lamb and your beehive from Dawnie. Love the wool pincushion and the stitchery, Donna. The clamp is a brilliant idea! I love your pincushions!!! what a great swap! You both made such a nice puncushions for each other! When I first saw your sheep pincushion I thought "how lovely", and then I saw the bees, and now I can't choose which one I like most. I may well copy them. Thanks for showing us. Thank you for your reaction on my blog! 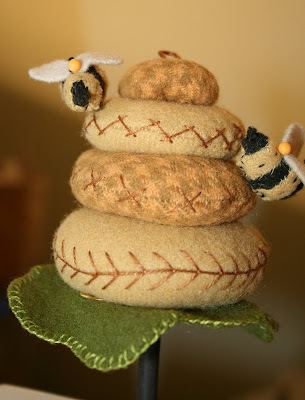 I love the pincushion you made en the one you received is a very very special one!! It's so cute! Greetings from Holland. I didn't know that the swap went to this part of the world to! How amazing! I really like the one you made with the sheep. It's so cute! You were a perfect swap match! You have made a very lovely pincushion. Your bees are wonderful. I didn't work with wool at all but now I will try it with a pincushion. Thank you for your sweet comment. What a lovely pincushions! It was realy a fun swap! I love both the pincushions !! It was so much fun this swap. Two beautiful pin cushions!! Especially love the bees! Larry the Lamb is a gorgeous pincushion, great work! Love the bee and hive pincushion you were sent; and the clamp on your narrow piece of table is an excellent idea! great pincushions you made and you received.